The world of pre-code comics, especially in the late 1940s and into the 1950s, was a wild, wild west of uncontrolled concepts and outlandish stories, and nowhere was this more evident than in the mother-disapproved horror comics. These comics were filled with ghastly tales, gory art, and a never-ending parade of chilling hosts from countless small publishers. The Haunted Horror series from IDW reprints a selection of these stories pulled from comics with such irresistible names as Weird Terror, This Magazine is Haunted, Worlds of Fear, and Web of Evil. 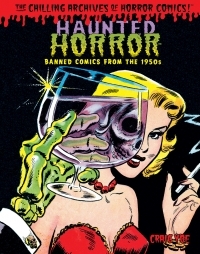 Volume 1 here specifically collects the first three issues of Haunted Horror. For those that may not be familiar this era’s horror comics outside of EC Comics, this is a lovingly put together collection that really showcases the range of macabre unleashed on the masses at the time and that EC in no way held the corner on the market. Featuring ghouls, ghosts, monsters, murder, mysticism, and revenge, there’s a new horror lurking behind the turn of each page.